Although not named on Canadian charts, the little bay on the south side of Baie Fine is well known as "Marianne Bay." It lies about two miles beyond the narrow Frazer Point entrance to Baie Fine, that beautiful, long inlet which we have not yet had a chance to describe for you. Marianne Bay provides an excellent anchorage for boaters who do not want to make the long trek to The Pool, about twenty miles or more farther inside Baie Fine. Marianne Bay was named after the daughter of Commander Eugene McDonald, the founder of the Zenith Radio Company in Chicago. Commander McDonald, his wife Inez, and their family used to visit the area in the 1930's. 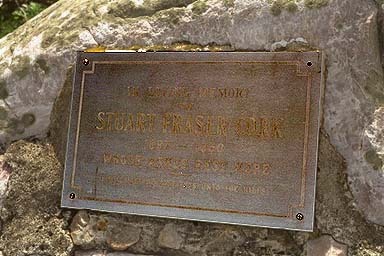 Despite the even more difficult access to the area in those days, it was not uncommon for it to be visited by prominent businessmen and celebrities. On a 1997 visit to the Bay we noticed a very large steel mooring buoy was set. This evoked visions of what sort of vessel could call here that might need such a large mooring. Most likely it was the the 185-foot motor yacht, the MIZPAH, owned by Commander McDonald. The yacht had a 27-foot beam and a draft of 10-feet. The MIZPAH was built from steel plates originally intended to be used in contruction of a vessel for the United States Navy. After World War I, treaty restrictions on the size of navies forced the abandonment of the project, but in 1926 the Newport News Shipbuilding & Dry Dock Co. finished the vessel as the private yacht SAVARONA, which sold for $525,000. 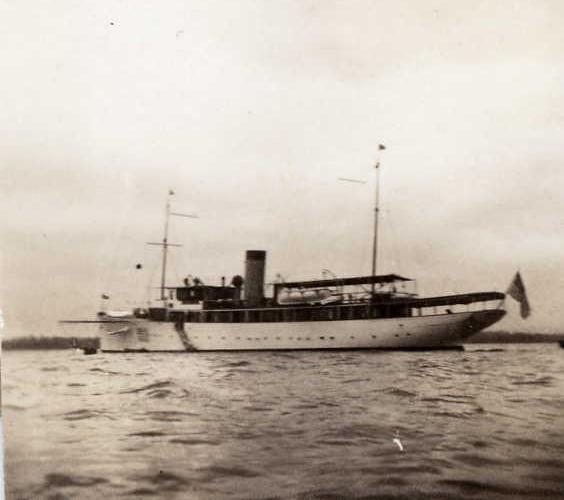 Commander McDonald bought the vessel in 1929 and renamed her MIZPAH, which means "The Lord watch between me and thee, when we are absent from one another." The McDonald family lived aboard the MIZPAH in the 1930's. It was one of largest luxury yachts on the Great Lakes, with gold plated door knobs and a crew of twentyseven. With the connection to Zenith Radio, it was outfitted as one of the finest floating radio labs in the world. Besides Great Lakes cruises, the MIZPAH was engaged in salt water expeditions and treasure hunts, visiting the Galapagos Islands in 1930 and the Carribean in 1938. In World War II, the MIZPAH became the Naval Ship PY29 and saw duty in the Atlantic. At war's end the vessel was sold to Merrew Shipping Company of Honduras for $17,500. For the next twenty years she hauled bananas from Central America to Tampa, Florida. After being damaged in a hurricane, the vessel was purchased by Gene Kinney, also of Zenith Radio Company heritage. Plans for repairs were not realized and ultimately the vessel was scuttled on April 9, 1968, off Palm Beach, Florida to serve as an artificial reef for fish habitat. Update: on a 2014 visit to Marianne Bay the old steel mooring buoy was gone. Besides neglecting to name the cove, Canadian chartmakers have shown soundings more shallow than those actually found here. Usually in this area we are blaming ancient chart 2286, but this time it is otherwise excellent small craft chart 2205 that mistakenly shows most of the cove as having less than six feet of water and featuring a rock awash in the middle. Neither feature is accurate, as my sketch below shows. While anchored in the cove, you can enjoy the scenery and watch a steady parade of boats heading back and forth in Baie Fine. The island which forms the northeastern side of the cove is privately owned and contains several cottages, but in all our visits we have never seen them occupied. 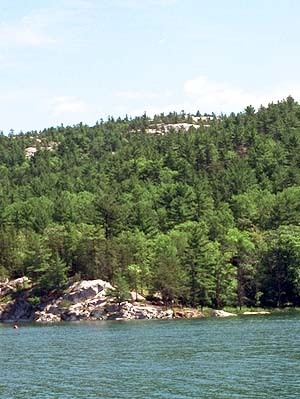 Towering above you to the east is Frazer Bay Hill, the summit of the Killarney Ridge of the South La Cloche Range. In the North Channel there are many opportunities to climb to points of lookout, but the trip to Frazer Bay Hill is perhaps the best of them all. This view is from our anchorage (shown in the sketch above), as we look eastward at the hill some 575 feet above the lake. 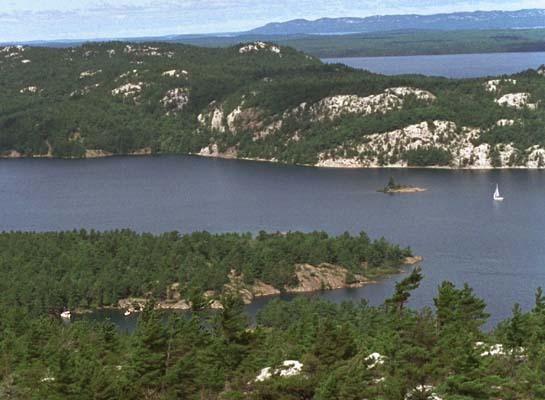 In 1988, in response the Save Baie Fine campaign of the North Channel Preservation Society, the Canadian Government added the name Casson Peak to the geography, in honor of the famous Canadian landscape artist and "Group of Seven" member, A. J. Casson. 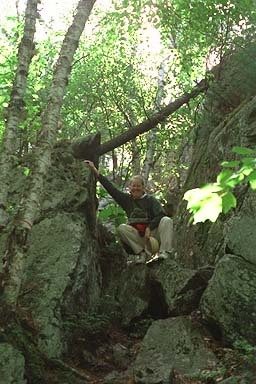 More about A. J. Casson and his love of this area can be found in an interview with him in c.1985. If you are inclined to climb, the trail begins along the shoreline, east of Marianne Bay. Take your dingy through the narrow channel behind the cottages, and come ashore about 100 yards east. You will find a trail that initially follows the shoreline then abruptly heads inland and upland, marked by red ribbons tied in the tree branches. Update: In 2014 the local cottager has put out a small floating dock along the shoreline about 100-yards East of the trail head to facilitate coming ashore in a small boat. From the dock, go West about 100 yards along a path to the trail head. As you climb the hill, the trees thin out and so do the red ribbons. Soon, little stone cairns replace them as trail markers. After about thirty minutes of easy uphill walk, you have to do some real climbing. The worst spot is this deep split in a huge granite rock, and this picture fails to convey the amount of vertical lift necessary to transit this obstacle. The camera is pointing almost straight up! It turns out to be easier going up than coming down through this little chasm, by the way. But after making it above here, you are on the home stretch to the top. Your legs will probably be burning a little, and you will be out of breath for sure, but the lure of the summit will pull you upward for another ten minutes of climbing. Continue on, because you will be rewarded for your efforts! On top of Frazer Bay Hill, the panorama is spectacular. 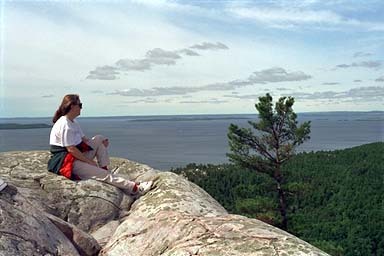 In this photo, Chris rests and takes in the view to the southwest, across Frazer Bay to Heywood Island in the distance. 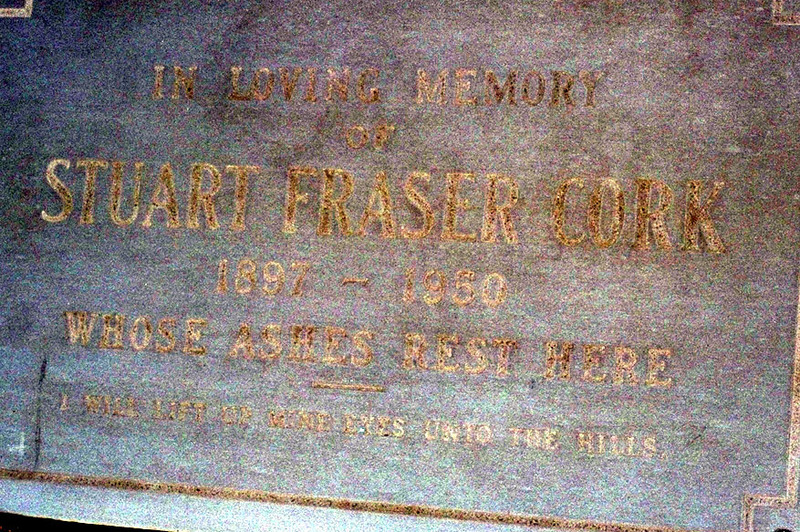 With such a well marked trail, we could anticipate that many others had visited here before us, but we were surprised to find that the summit was the final resting place for a fellow climber. Finally, here is the view of Baie Fine from the top of Frazer Bay Hill/ Casson Peak. You can just see our boat anchored along the western side of Marianne Bay. For more photographs of Frazer Bay Hill, see the Sail-Log from our 1997 visit. 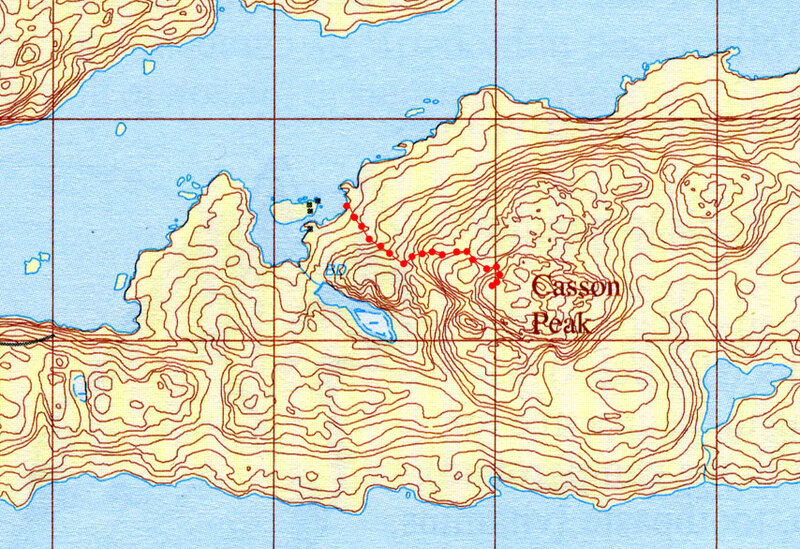 Thanks to modern technology, a previous climber published his GPS track of the assent to Casson Peak. I have overlaid that track onto a topographic map of the area, and from this you can see the general route of the assent, which followed the marked trail mentioned above. Thanks to Jeff Rolhfing for help combining the graphic elements of this map.